Last Friday was a different day. We woke up and went to breakfast with Daddy as a special treat. Afterwards, we were going to head back home and do some table work. But, the weather was so Fall-ish I just couldn't bear to coop the girls up inside. So, we stopped at home and ran in for our field guides, binoculars, and nature journals, and headed for the park. It was a glorious day, in which we spotted two deer, at least 4 different types of butterflies, and other great nature finds. Amaleah was inspired and drew several sketches of robins and buntings along with some bark rubbings, and even Julia got wrapped up in the excitement. We played and enjoyed. Then we headed for home to finally get the checklist done...But Amaleah was soooo inspired to write a book entitled "Poem Book" that I felt it was my Charlotte Mason duty to let her, and I'm so glad I did. 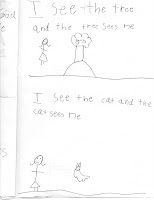 She proceeded to write and illustrate this cute book based on "I see the moon and the moon sees me" (for the moon was another one of our spottings that day). What's funny is Amaleah will remember this day (and all the butterflies she saw) for years to come, whereas she probably won't remember an individual "regular school day" (or what she learned) quite as well. You made wonderful memories and are developing a love of the outdoors.... what could be better? oh yes, and it is very Charlotte Mason/unschooling of you! You need those days every once in a while! I love it! very inspiring . . .